One cool feature on my new laptop is a digital media slot, which means I can plug my digicam’s memory stick directly into my computer. Although I never used to complain about having to use a USB cable to dump pictures from camera to (old) laptop, now that I don’t need that cable, I’m wondering how I survived so long without the ability to download pictures directly from camera to laptop. 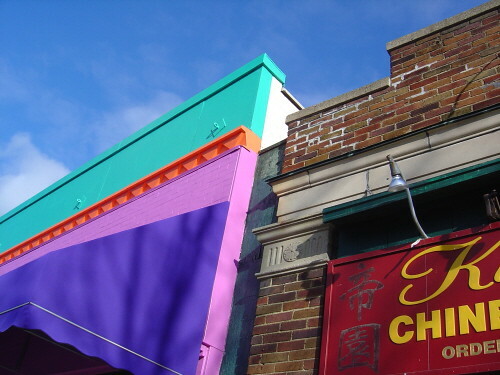 Today’s picture is nothing special: just a quick snapshot of Cool Jewels’ freshly painted Main Street facade. But I am loving the fact that I didn’t need a cable to transfer this pic from camera to laptop…and thanks to my new laptop’s brand-new battery, I didn’t need a pesky power cord for my morning emailing, blogging, and web-surfing. When you have a brand-new toy, even simple pleasures seem amazing. How did I survive so long without the ability to live online cord-free? Today’s Photo Friday theme is Best of 2005. I don’t know if this is my “best” photo from the past year…but it’s certainly one of my all-time favorites. Taking good pictures on a good day in Keene is child’s play: aim your camera and shoot. If I take a lot of alluring pictures, that’s in large part because I live in a particularly photogenic town…and I carry my camera everywhere, taking at least a handful of pictures everyday. Although I didn’t list in my Favorite Five countdown the post in which this photo originally appeared, it is one of my favorite Keene-related blog-entries, telling as it does the story of how I came to teach and then live here. Best of all, if you do a Google search for prettiest town on earth, my post is first…and if you do a Google search for prettiest town in America, my post about little ol’ Keene is second, bested only by the Chamber of Commerce site for Woodstock, Vermont. So, when it comes to asserting America’s prettiest town, who are you going to believe: a Chamber of Commerce site hawking the tourist virtues of some town in Vermont, or an independent, no-strings-attached site written by someone who chronicles her town in all weathers, day in and day out? While you decide for yourself whose town in the fairest of them all, I’ll remain steadfast in my belief that an image of a picture-perfect white church spire nestled in white crabapple blossoms against a spring-blue sky is the best it gets in 2005 or any other year. Yesterday Gary and I took a quick trip to Northampton, MA where we met A (not her real initial) for pasta and margaritas. 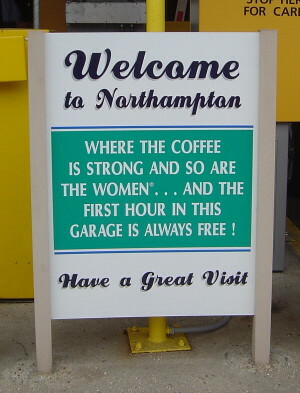 The last time I was in Northampton, Leslee and I were disappointed by weak margaritas. I can’t vouch for the strength of Northampton coffee, but I do know that strong women occasionally enjoy strong beverages, so I’m happy to report that yesterday’s quest for a passable margarita ended happily at La Cazuela Mexican restaurant and tequila bar. Although the margarita-and-a-half I shared with Gary last night didn’t compare with the margarita-and-a-half I shared with Leslee in Salem in October, last night’s marg wasn’t a bad way to end a leisurely afternoon spent shopping, tea-sipping, and strolling. I’m typing these words on my new laptop, which I bought (with Gary’s technical assistance) on Tuesday night. It’s been nearly a year since Reggie removed several keys from my aging and quirky-as-hell laptop, so I was long overdue for either a repair or a replacement. Since I was a Good Girl this year, Santa stuffed my stocking with some cash: thanks, Mom & Dad! So for the first time ever, I used this money to make a major expediture for Yours Truly. Although this isn’t my first laptop, it’s my first new laptop, my old one having been inherited from my ex-husband before we divorced. Fittingly enough, my new laptop cost as much as the lute I’d bought my ex three Christmases ago: somehow, I think it’s significant that I’ve moved from buying new loves for old lovers to buying the high-tech tools I need to support myself, thank you. So today I’m switching back and forth between two laptops, old and new. The new one has all its keys, a functional battery, and plenty of bells and whistles I haven’t yet explored, including a remote that I never knew I needed. The old laptop has all my documents and programs, including msWord…the install CDs for which, I’ve recently discovered, I did not inherit from my ex in our divorce. So today I’ll be pumping even more money into the US economy as I move from looking for the perfect margarita to looking for the perfect educational-discounted software package, the perfect laptop case, and all the other accessories and accoutrements a strong woman needs to carry and tend to her bells and whistles. It takes a strong credit card to keep a strong woman satisfied…and after all the shopping’s done, both Gary and I will probably need another margarita-and-a-half (or two!) to fortify our strong selves. Yesterday was my second anniversary (blogiversary?) here at Hoarded Ordinaries: yes, it’s been two years and a day since I posted my first tentative blog entry on December 27, 2003. This past year has been an eventful one in my blog-life, with me making many face-to-face connections with bloggers whose lives I’ve read: Beth and Ivy in Peterborough, NH in January; two overlapping bands of bloggers in New York City in February and Cambridge, MA in May; Leslee, Rachel, and Andi (now Soen Joon!) in Northampton, MA in April; Fred and Tsuga in Floyd County, VA in July; and that girl in New York City in October. Yes, it’s been a wide-roaming year here at Hoarded Ordinaries…and that’s not counting summer trips to see Gary in Findlay, OH or my aunt in Washington, DC. 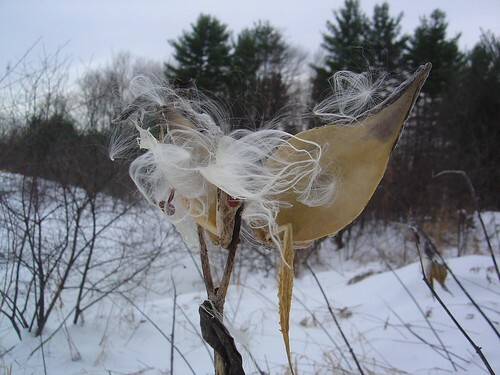 When I first started Hoarded Ordinaries two years and a day ago, I envisioned myself writing a place blog that would focus on the human and natural history of my adopted home here in Keene, NH. Looking back over those two years and a day, I see my place blog is movable, focusing on Keene when I’m here and other places when I’m not. In the spirit of last year’s first blogiversary post, here are my five favorite posts from 2005, listed in order of appearance. Keep Out, January 23, 2005. I wrote a post about the boundaries bloggers do or don’t place around their personal lives…and what resulted was a lively comment exchange on the question of how much self-disclosure is too much. What I find interesting in retrospect is how Hoarded Ordinaries quickly morphed from being a “place blog” into being a “kinda place, kinda personal, kinda literary blog.” I’m still unsure how to categorize HO…but since I’m still here blogging two years and a day after starting, I must be doing something right, categories be damned. Conspicuous Projection, February 5, 2005. Of my various posts on consumer culture featuing reflective shots of Yours Truly, this one from the Pheasant Lane Mall in Nashua, NH is my favorite (with my March 15th post on Ikea being a close second). I’m particularly fond of the blind reflective shots I captured on an assortment of shiny household items in the mall’s Target store as well as a fuzzy picture of a photogenic baby in a nearby portrait studio. The art of possibility, February 20, 2005. This post (along with the companion piece Why not “yes”?) summarizes in word and image a whirlwind trip to New York City to see the Gates in Central Park with a merry band of blog-buds. It was a memorable once-in-a-lifetime experience seeing installation art with “virtual strangers” turned friends, and I cherish these two cyber-souvenirs because of that. Aftershock, April 7, 2005. Illustrated with more reflective shots, this post checked my emotional pulse six months after my divorce. Try as I might to insist that HO is nothing more than a place blog, some of my favorite posts are intimately personal. So sue me. Hunger, April 17, 2005. When I wrote this post about my lean and hungry years in Boston using an image of the Irish Famine Memorial as a central metaphor, I had no idea the essay would garner such positive comments. In my mind, this was another self-centered musing about time and place…but now that I re-visit it as a reader, I can see why it resonated. I’m not sure what it says that my five favorite posts from 2005 come from the first four months of the year. Perhaps those first four months were a particularly fertile time for my writerly imagination, or perhaps these “older” posts seem more seasoned and properly ripened than relatively newer ones. In recent months, I’ve suspected the obligations of a particularly weighty semester interfered with my ability to devote the kind of attention I feel good writing demands: at times over recent months, I’ve felt I’ve had too many days where a hurriedly posted picture substituted for “real” writing. But maybe 2005 isn’t yet seasoned and ripe enough for me to be a real judge. Maybe I have to wait another two years and a day to tell how resonant my words and accompanying images truly are. If you’re looking for something good to read while I continue this weekend’s Serious Napping, be sure to check out last week’s “Finding Home” posts on Qarrtsiluni: a cartoon by Diogenes, a poem by Patry Francis, and a photo by Yours Truly. Enjoy! If a picture is worth a thousand words, then two photos should be worth two thousand. I’ve come to rely on Photo Friday to inspire my quick ‘n’ easy week-ending blog posts. Give me a topic, I slap up a picture, and I’m outta here: bada bing, bada boom. Unfortunately, today there’s no new Photo Friday topic, leaving lazy bloggers like me without the usual inspirational crutch. So today I decided to slap up two random photos that I took the morning after the big snowstorm that buried my car a couple weeks ago. When you take photos nearly every day, you end up blogging only a portion of those pix: some are too odd, quirky, or random to make the blog-cut, even if they’re shots you personally like. Yes, at some future point I might have need for a picture of a picnic table buried in snow or a rocking horse looking forlornly out a downtown shop window. But for now, these two pix are the makings for a quickie Friday blog post. Having slapped them up, folks, I’m outta here for the holiday: bada bing, bada boom to you and yours. PS: One of the cool things about having a blog-bud like Sheelzebub (aka Pinko Feminist Hellcat) is when you see a news story that infuriates you in more ways than you can count, you can forward it to the Hellcat and she’ll express your outrage better than you could. Yes, folks, both racism and sexism are alive in New Hampshire: don’t let anyone try to convince you otherwise. As if cards proclaiming “Happy Holidays!” weren’t enough of an abomination, members of the Religious Right would have a collective coronary if they could see my apartment. I’ve already blogged my oddly ecumenical altar with its mix of Buddhist and Christian iconography. After having waited too long last year to buy a proper Christmas tree, this year I wanted to do up the season right. ‘Tis the season, after all. So excuse me if I don’t apologize for my eclectic taste in holiday decor. If you’re offended by the sight of Buddha meditating alongside a Christmas tree, a crucifix adorned with Tibetan prayer flags, or a Santa stocking hung within sight of a bronze Buddha bookend and Kwan Seum Bosal tapestry, you can move along now, thank you. Here at my inn, there’s room a-plenty for the baby Jesus, Buddha, Kwan Seum Bosal, Santa, and any other spiritual aspirant looking for a place to stay. Why settle for just one Happy Holiday when you can have Happy Buddha-days in abundance?